While spending some time with Deb Cram at Seacoast Media Group yesterday, I walked her through how to plug her smgphoto Twitter feed into her Facebook profile. I realized later that we have many bloggers -- and a few Tweeters -- around Ottaway that also have Facebook accounts who could benefit from the same tutorial. At the very least, it will help you share your blog with friends and family in addition to anyone else you're connected with on the social network. First, grab the URL for your blog's RSS feed. In the case of our Mzinga blogging platform, there is an XML button at the bottom of each blog's entry page from which you can grab the URL. 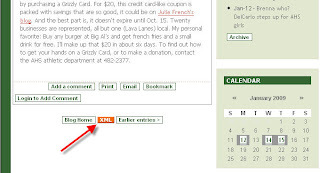 Right-click on it and in Firefox select "Copy Link Location," or in IE select "Copy Shortcut:"
Once at the Notes page, click on the link to "Import a blog" under the heading "Notes Settings:"
There are other, more elaborate ways to accomplish the same goal, especially if you are active on Twitter. You can create a Twitterfeed account, and plug that same RSS feed into Twitterfeed so it will update your Twitter followers when you post a new item. 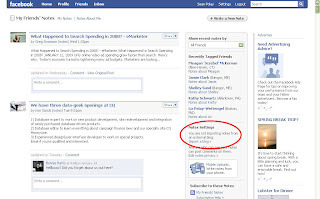 In turn you can add the Twitter application to your Facebook profile, and allow it to update your Facebook status every time there is a new item posted to Twitter. But if you're not yet feeling that adventurous, just sync up your Facebook Notes with your blog feed, and you'll be on your way to being a practitioner of viral marketing and content distribution. Thanks Sean. I've been plugging my private blog into my Facebook account and it only allows one blog feed. But, I followed your advice and created a Twitterfeed for my ADT blog. I'll get all the other newsroom folks to do Twitterfeeds and Facebook too if they want to share their blogs. I'm betting they all do it. Sean, just had one of my staff bloggers try this and it's pretty neat, except it posts the full blog as a note instead of linking back to the actual blog (which would generate traffic and keep all comments in one place). Anyway around that? Jeanne, I think the full blog-to-Twitter-to-Facebook integration will accomplish what you seek. 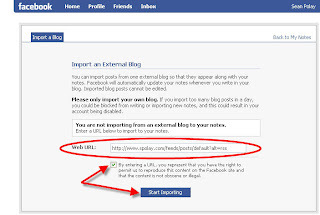 A third method is simply to manually post the link to the Facebook profile. 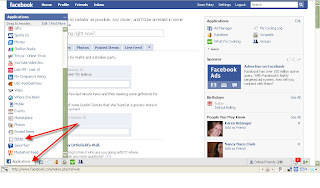 You can click the "Share Link" tab on your Facebok profile, or Facebook offers up some instructions on how to add a button to your Firefox toolbar to accomplish the same without having to go to your Facebook profile first.